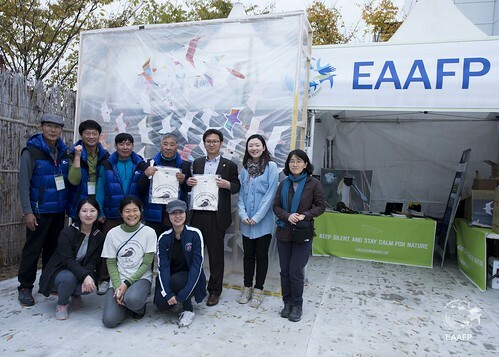 From November 6th to 8th 2015, members of EAAFP Secretariat participated in the Geum River Migratory Bird Festival in Seocheon, Republic of Korea. 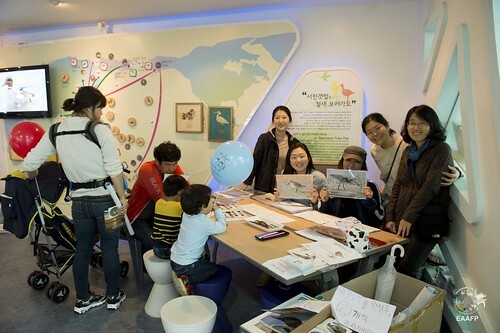 The festival took place in the Bird Village, near the Geum River Estuary. Many government officials including the mayors of Seocheon and Gunsan city and Deputy Director joined the opening ceremony. 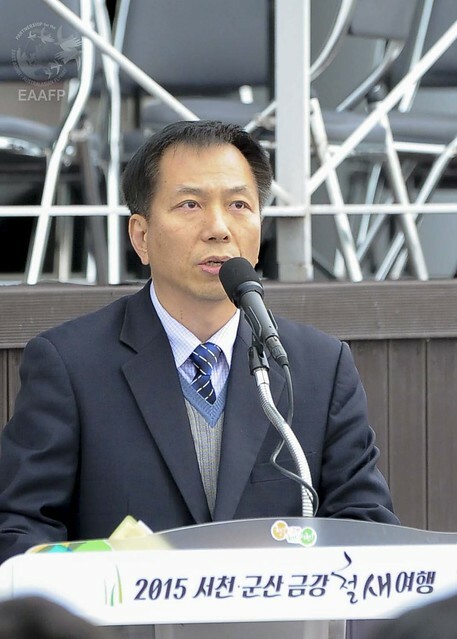 The Deputy Director of EAAFP, Mr. Jong-Ok Jang delivered a congratulatory speech for the event that welcomes migratory waterbirds and emphasizes the importance of conservation of the birds and their habitats. 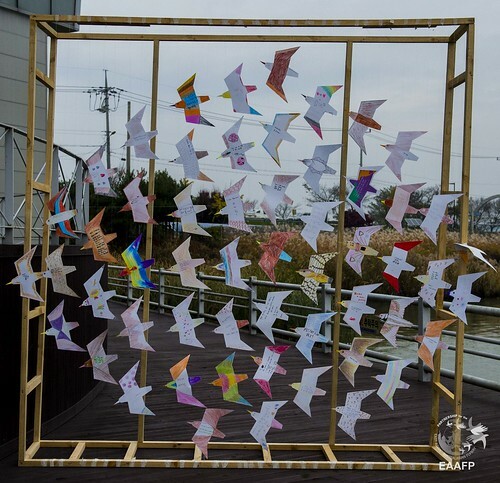 “Migratory birds do not belong solely to the Republic of Korea,” he said, “We have to share and protect them in cooperation with other countries in the flyway.” He also mentioned the crucial role that Geum River Estuary [EAAF100] and Yubu-do Tidal Flat [EAAF101] play for threatened shorebirds, such as Spoon-billed Sandpiper and Bar-tailed Godwit. During the whole ceremony, a three-metre-high display of ‘To Our Winged Travellers‘ stood behind the emcee. The wind coming from the estuary made the paper-birds look livelier than ever. The birds seemed as if they were about to take off to join the flock up in the sky, delivering messages written on their back. The festival had a lot of interesting environmental education activities, including making paper binoculars, examining a wetland miniature and experiencing a rice paddy. 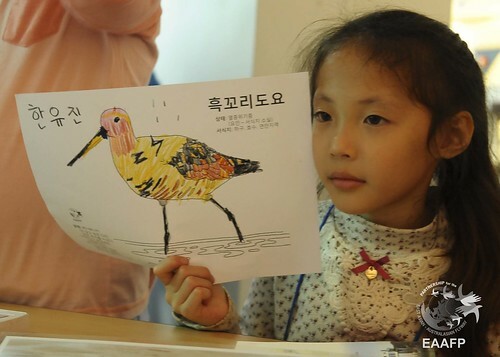 EAAFP offered some activities where participants could colour bird drawings and write letters ‘To Our Winged Travellers.’ Visitors could take a close look at the birds and thought about the long journeys migratory birds take every year. These activities continued for three days. Young and old, people enjoyed them. On the second day, EAAFP staff took a short birdwatching trip to the Geum River Estuary and Bongsun Reservoir. Even though it was raining consistently, we saw lots of waterbirds, such as Greenshank, Grey Heron, Mallard, Northern Pintail, Little and Great Crested Grebes. To see more photos, visit our flickr.